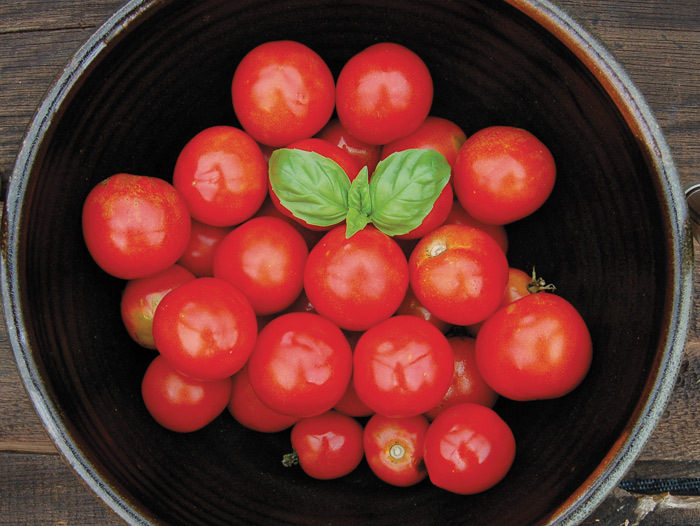 Whether you grow on a patio, porch, rooftop or fire escape, it’s essential to choose the right tomato varieties when growing in containers. Look for determinate or semi-determinate varieties, which have a more concentrated fruit set and a compact habit. It’s also best to look for varieties that start producing early — so you can get the most out of your containers. Make sure your containers are big enough — 3 to 5 gallons is the minimum — and that they have drainage holes and good-quality potting soil. Also keep in mind that semi-determinate (and sometimes even determinate) varieties will probably need a cage or stake to provide support once the plants are about 24″ tall. 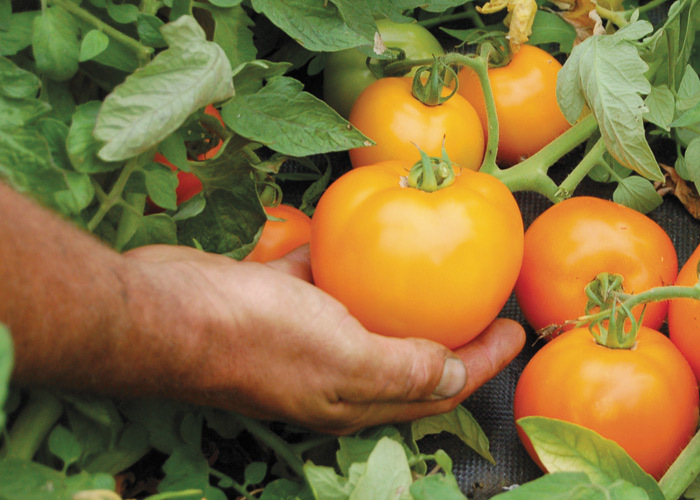 With regular watering and monthly fertilizing, you can grow a bumper crop of tomatoes just about anywhere. All of the varieties featured in this post are available at High Mowing Seeds. Moskvich is beloved for its impressively early yields of deep-red, 4- to 6-ounce fruits with rich, luscious flavor. This Russian heirloom tolerates cool conditions and produces high-quality, crack-resistant fruits that rival hybrids. A semi-determinate variety that will produce an early, heavy crop of fruit and continue producing all season. 60 days. 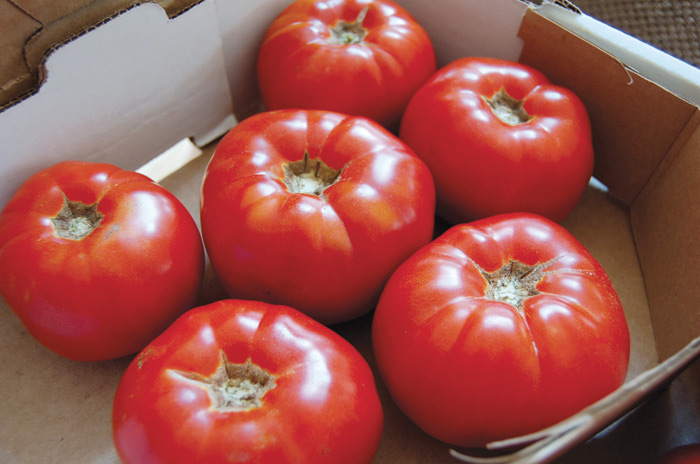 Glacier is a favorite in the north and beyond for its exceptionally early maturity and great tomato flavor. Saladette-sized fruits (2-3″) are bright orange-red and consistently win early-season taste tests. The potato-leaved plants are semi-determinate, meaning that they will produce an early, heavy flush of flowers and fruit, but will then continue to produce through the end of the season (unlike standard determinate varieties, which produce most of their fruit at once). 55 days. 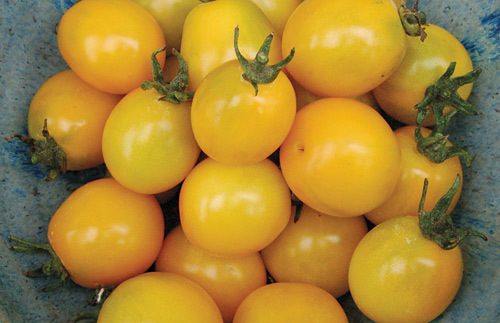 Gold Nugget produces bright yellow cherry tomatoes early and abundantly on compact plants. The 1″ fruits are juicy, mild and sweet – excellent if you prefer a low-acid tomato – with marvelously thin yet crack-resistant skin. This determinate variety was developed at Oregon State University. An excellent choice for hanging baskets. 60 days. Sunkist F1 produces perfect large orange slicing tomatoes. The slightly flattened 8- to 10-ounce fruits are firm and unblemished – and just as sweet as red tomatoes. A unique variety bred by Dr. Brent Loy of the University of New Hampshire, produced on the High Mowing seed farm and available exclusively from High Mowing. A semi-determinate variety that will produce an early, heavy crop of fruit and continue producing all season. Resistant to fusarium wilt and verticillium wilt. 78 days. Indigo Rose offers the best of both worlds: an exotic edible fruit that grows on a beautiful ornamental plant. Clusters of six to eight 2-ounce fruits ripen to jet black with red undersides and aromatic flavor. The compact plants are vigorous and disease-resistant with a compact habit and purple-tinged foliage that is absolutely stunning in ornamental plantings. 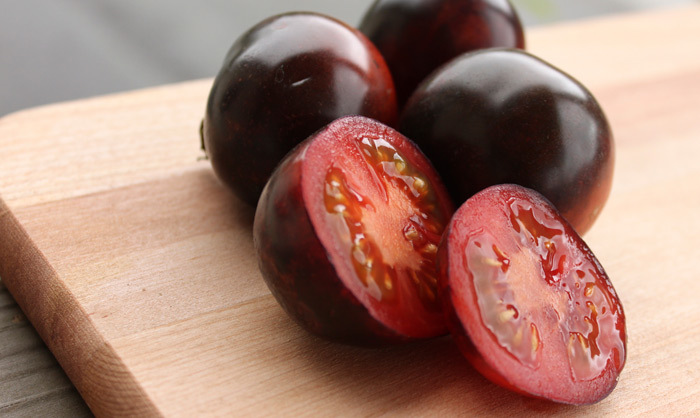 Indigo tomatoes are rich in the antioxidant anthocyanin. A semi-determinate variety bred by Dr. Jim Myers at Oregon State University. 75-80 days. I keep failing at growing tomatoes. Little green worms devour the plants. Any suggestions? We had a gas stove with a pilot light; we’d put seeds inside a white moist paper towel & kept it moist, the seedlings germinated quicker. Then we transferred them to wooden boxes left on the window sills. When they were about 8-10” high we transplanted them outside-weather permitting. We cut layers of newspaper + rolled them up to act as collars at the base; you may want to put the collars 2 or so inches below the soil + have about 5″ visible above ground. We seldom had cut-worms using this technique. Hope this helps.